*Pants have hair inside both cuffs and has been worn. 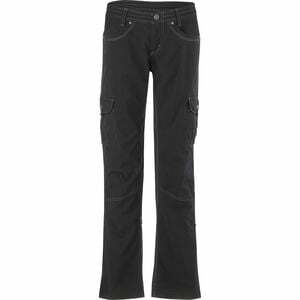 The Kuhl Women's Splash Roll-Up Pant is lightweight with a soft, cottony feel, and just enough spandex in the weave to keep you moving freely on the trail. If you start to warm up, snap tabs on the lower leg let you roll up the cuffs and secure them. This also comes in handy if you come across a mountainside stream you simply have to dip your feet into. And, should you slip on a mossy rock and get a little wetter than anticipated, the Splash pant dries faster than cotton, so by the time you get back to down you'll be dry and ready to grab a quick dinner with friends.